Rail historian and blog reader Ian Pell has been in touch again, with more musings on the aerial photographs featured here from Gareth Thomas, of Lichfield District Council. Ian adds yet more great historical info about railways as revealed by the images, and on the subject of earlier electrical supplies in our area as discussed here a couple of days ago. I thank Ian for his wonderfully thought out and well crafted pieces – they are wonderful and I always enjoy posting them up. Cheers. 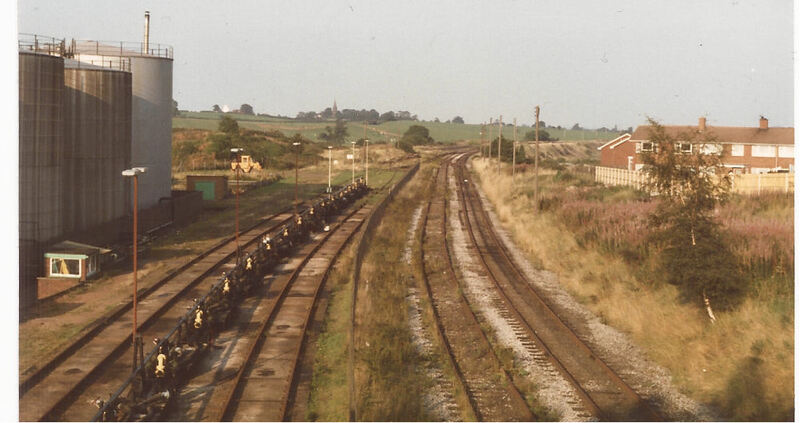 Anglesey/Anglesea Sidings served the now long-gone Charringtons Oil Terminal in Newtown for many years. Image from The South Staffordshire Railway Group. Some thoughts on the recent article – ‘Curious electric‘. Like many places associated with the London & North Western Railway, Anglesea Sidings are no different. The spelling has alternated over the years between ‘Anglesey’ and ‘Anglesea’. Certainly, in railway circles in BR times, ‘Anglesea Sidings’ is the name most commonly referred to in railway documents and which adorned the signal box. The last working colliery on the eastern shore of Norton Pool was No.8 which closed in January 1962. As I understand it, the washery at No.3 continued for a little while after but by mid- 1962 it is true to say that the only NCB facility still operational and served by the mineral lines was ‘Wembley’ Central workshop. The line south of the junction with the original ‘Cannock Chase and Wolverhampton’ line was redundant, although I believe it was still in-situ after the 1960 date which has been given for closure. Using Clouseau-like techniques I believe the excellent, and recently published, June 1963 aerial photographs reveal the line to still be in existence at that time. I would suggest that it was abandoned and that the five sidings at the landsale wharf at Anglesea Sidings had been removed. Prior to the coal traffic ceasing the down sidings at Anglesea were used for wagons to and from the mineral railway. If you look very carefully at Anglesea Sidings on the June photograph, two things are striking; one the empty coaching stock which was used for Saturday only excursion traffic, and at this time, some weekly workers trains from Brownhills to Witton and Vauxhall; and, secondly, the line of ‘white’ wagons which I suspect may be tank wagons and possibly the embryonic start of Charrington’s oil traffic. Both of these trains are in the Down sidings (Walsall side). To the right are the Up sidings, which are actually on the down side of the running lines – yet another LNWR idiosyncrasy! The Working timetable of June 1962 indicates that empties were still ‘booked’ from Norton Junction and Birchills Power Station to Anglesea Sidings; with loaded trains returning to the same destinations. However, by the September timetable such workings had ceased and the sidings were only booked to be used by empty coaching stock. It is probable that these workings actually finished as soon as the stocks of coal at No.3 washery were exhausted and there was no more slack for Birchills Power Station. I would say that dates are a minefield to get right and that, certainly in railway parlance, they can relate to all sorts of variations on the meaning of ‘closure’. So if anyone can confirm dates I am more than pleased to know. Possibly the last run through Brownhills on the South Staffordshire Line. Film courtesy of South Staffordshire Railway Group. The video is speeded up. St Anne’s Free Church contains a bust to a man I consider to be the Brunel of the Midlands. John McClean, an engineer by profession, was a Victorian through and through. Not only was he instrumental in creating the South Staffs Railway, but he also created the mining on the eastern shores of the Pool, the South Staffs Water Company and was involved in undertakings such as the Suez Canal. At one stage he was the sole lease holder of the South Staffs Railway, a feat that only one other person has undertaken in the history of the railways of Britain. He was also one of the founders of Chasetown and the church where his bust resides. I know nothing of the above relates to the Cannock Chase Colliery Co.’s electricity supply, but as a final twist to my ramblings, the Colliery also supplied electricity to the railway, in particular to light the sidings at Norton Junction. In a seven year agreement signed on the 2nd May 1923, the railway company was to pay 50% less than the ordinary lighting consumer supplied by the Colliery Company, on the proviso that a minimum of 8,000 units per annum were used. In order for the supply to be provided, the Colliery Company had to apply to the Electricity Commissioners for a special order under the Electric Lighting Acts, authorising them to supply electricity within a defined area, ie:- the railway sidings. I knew I’d get to the electricity bit in the end! Hope the above is of interest to you. a big thankyou to Ian, please ! Very intresting, nice one Ian and Bob, thank you.